Today we have a double feature in our continuation of our Best New Building Products series from JELD-WEN Windows & Doors. Both are innovative and interesting. JELD-WEN recently introduced a new line of Custom Wood Tilt & Turn windows, which offer the functionality of a casement window (hinged on the side to swing inward) and the ventilation of a hopper window (hinged on the bottom to open inward at the top). They are available in sizes up to 48 x 84 inches, and the windows come in either solid-pine wood or a sustainable SFI-certified wood. These windows are offered with a 20-year warranty, plus with protection against wood rot, termites, and water saturation. These windows make for excellent, draft-free ventilation using the inward tilt function, and for easy cleaning when opened completely. 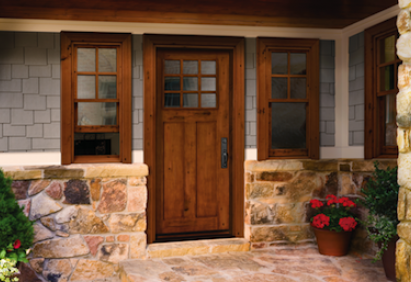 As the demand for “green” and reclaimed building products grows, JELD-WEN recently launched its Custom Reclaimed Wood line of both windows & doors. They are made from reclaimed Douglas fir originally used for fencing, barns, houses, and factories. They offer several reclaimed wood options for doors and planed finishes for windows, allowing homeowners to mix and match window & door styles. These reclaimed wood products make JELD-WEN the first window & door manufacturer to offer reclaimed products. Other companies such as Andersen should soon follow, as demand for vintage-styled reclaimed wood products continues to grow. 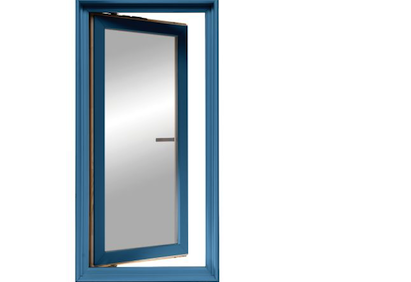 Thanks to HousingZone.com for their reviews of the tilt-and-turn windows and reclaimed wood windows & doors! Nice wood design door. This is a nice custom reclaimed wood.